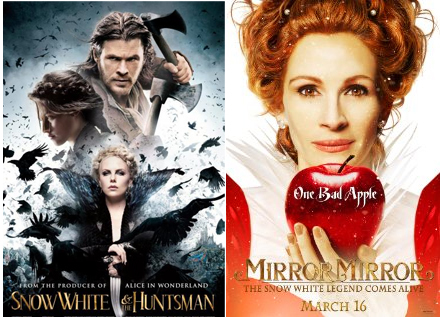 Two Snow White films within weeks of each other – which is better? Not sure why the sudden fascination with Snow White, but I saw the second of two recent retellings of the Disney tale – Snow White & the Huntsman. This version was much darker than the other (below) and provided the viewer with much better special effects. Although their role in the story was downplayed, I did like the casting of the dwarves and the effect of shrinking them down. Lots of action, lots of special effects, Charlize Theron – its a win. A few weeks back, Dawn and I saw the other recent Snow White film, Mirror, Mirror. Although this one got panned by critics, it was a lot of fun. This was definitely the funnier of the two. Sure, it was cheesy. Sure, it was campy. But it was fun… and that was the point. Julia Roberts was a blast and Armie Hammer did a great job as the huntsman. The dwarves were a much more lighthearted and entertaining bunch and a lot of fun. The Bollywood scene and credits absolutely rocked. If you want a fun time, Mirror, Mirror is the Snow White to see. If you want action and special effects, Snow White & the Huntsman is the winner. Better yet, see them both because they were both good in their own way.